As the days grow shorter and the weather colder, only a few things can comfort us: a roaring fire, hot chocolate, or a good bowl of hearty soup and what’s better than everyone’s favourite classic – tomato. But this recipe has a little something extra special that sets it apart from Heinz or Campbell’s. Not only do the roasted garlic bulbs taste amazing, but when combined with the vitamin C antioxidants in the tomatoes, they make for a great flu-fighting remedy. The kick of chilli is also sure to clear out your sinuses. So serve up this soup for you and your flatmates, and keep those colds far away from deadline season. Cut the tops off the garlic bulbs and place them on a piece of tin foil each. Drizzle these in oil and wrap the bulbs up in the tin foil before placing them on the same tray with your tomatoes. Roast the tomatoes and garlic for 45 minutes to an hour. You’ll know when they are done if the tomatoes are cooked, soft and browning. After taking the vegetables out the oven, unwrap the garlic and leave to cool. Whilst the tomatoes and garlic are cooling, dice and fry up the onion in oil until starting to brown. You can then add the tomatoes and garlic to the pan, squeezing the pulp from the garlic cloves and using a spoon to scrape any leftover bits out. Stir and let the mixture simmer for about 5 minutes on a low heat, then add a cup of water before letting it cook for another 5. At this point, add the single or soya cream. Start with 150ml, but you can add more depending on how rich and creamy you want your soup. Also add a teaspoon of chilli powder (or more or less depending on your spice tolerance). Leave this to simmer while you roughly chop the basil and stir in. 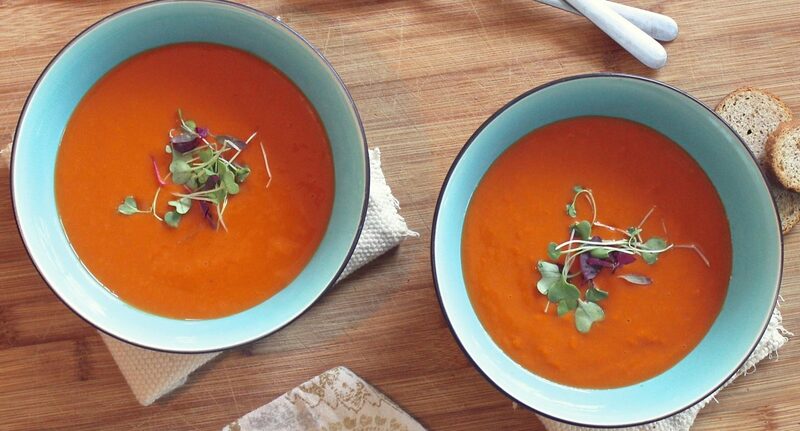 Gently blend the soup using a hand blender to get it as smooth as you would like. I like to leave it a little bit textured and then let the soup simmer for another 15 minutes to let the soup thicken and let the flavours develop nicely. Add salt and pepper to taste before serving! This soup works really well on its own or served up with warm, crusty bread and butter. I also like to stir in a teaspoon of Worcester sauce into my bowl right before I eat it for an extra depth of flavour.